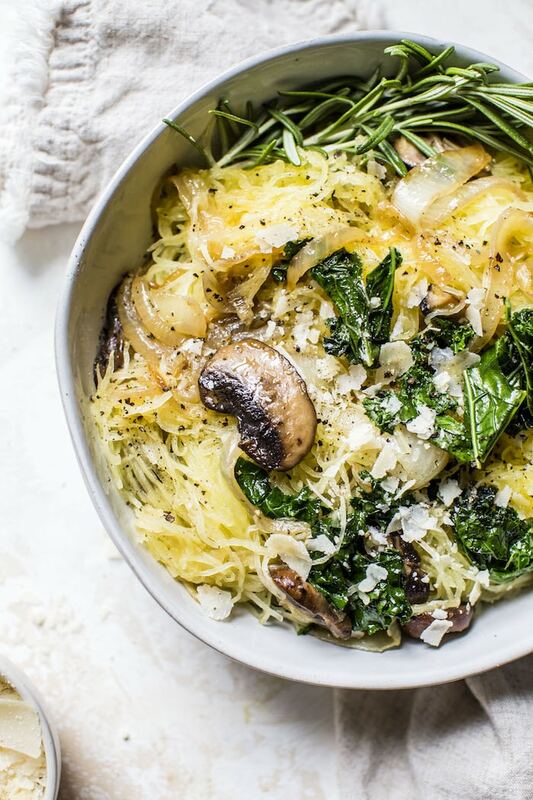 Onions sautéed with butter and olive oil create this scrumptious Caramelized Onion Spaghetti Squash. Mixed with kale and mushrooms for a healthy, colorful meal. 1) Recipes with minimal ingredients. The fewer the ingredients, the more likely you are to make a recipe. 2) Recipes with attainable ingredients. If a recipe calls for strange ingredients, you probably won’t make it. To clarify, “strange” ingredients is sort of a loose term because what one person defines as strange or uncommon another person may define as totally attainable. Most importantly, I’m going to do my best to stick to simple recipes that use common ingredients and require 30 minutes or less. That said, this is a HEALTHY food blog, so a recipe may call for coconut flour instead of whole wheat flour because I’m trying to healthify (<<not a word but should be) a recipe for you. Plus, I kind of love coconut flour and, from what I’ve seen, most grocery stores sell it these days. 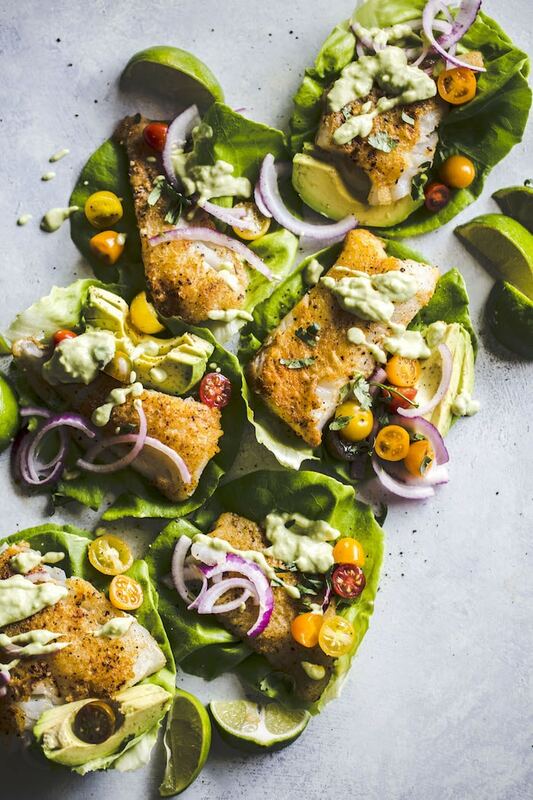 Above all, I want to focus on recipes made with REAL good-for-you ingredients to fuel you throughout your day. Firstly, can we PLEASE talk about caramelized onions? Have I professed my love for them before? Maybe, but I’m going to do it again. Gahhhh they’re just perfect, and dare I say THE BEST way to eat onions?! Consequently, I’d never roasted spaghetti squash before, and as it turns out, it’s really simple and getting the “spaghetti” out of the squash is weirdly fun and it’s a great way to enjoy a spaghetti-like dish without using actual pasta. This caramelized onion spaghetti squash should come together in less than an hour, give or take depending on the size of your squash. The larger the squash, the longer it’s going to take to roast. Mine was not very big—maybe 2-3 lbs—and it fed both my brother and I, so you definitely don’t need anything too too big, and as for the cheese, it’s completely optional–seriously, your call! 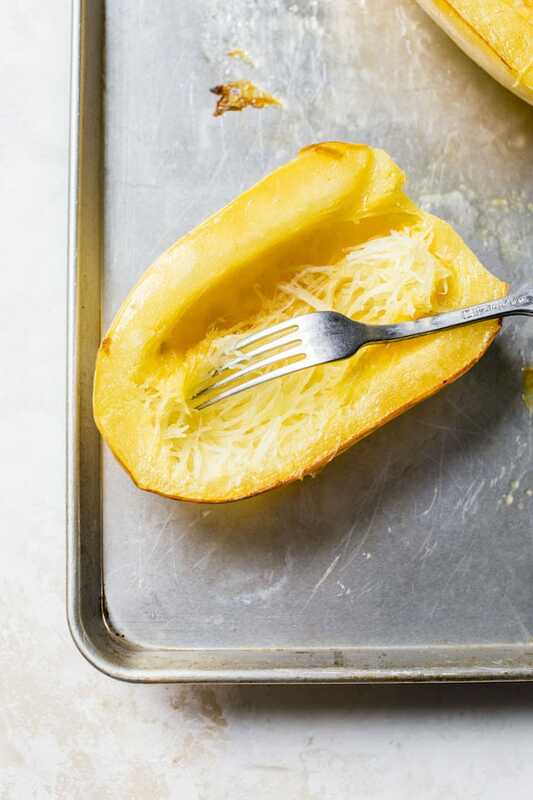 Once the squash is roasted, you’ll take it out of the oven and carefully use a fork to remove the “spaghetti”, then add the spaghetti squash to the skillet with the caramelized onions, making sure to stir everything together. In addition to the onions, the squash will be flavored with a little rosemary and cheese if you opt to use it, plus kale, mushrooms and plenty of salt and pepper. It’s so simple yet so tasty as well! Now what are you waiting for?! Get CARAMELIZING. If you make this caramelized onion spaghetti squash, make sure to tag @thealmondeater on Instagram so I can see your creation! If you’re looking for more caramelized onion recipes, check out my spinach and caramelized onion dip AND my caramelized onion and parmesan quinoa— both delicious and healthy recipes! 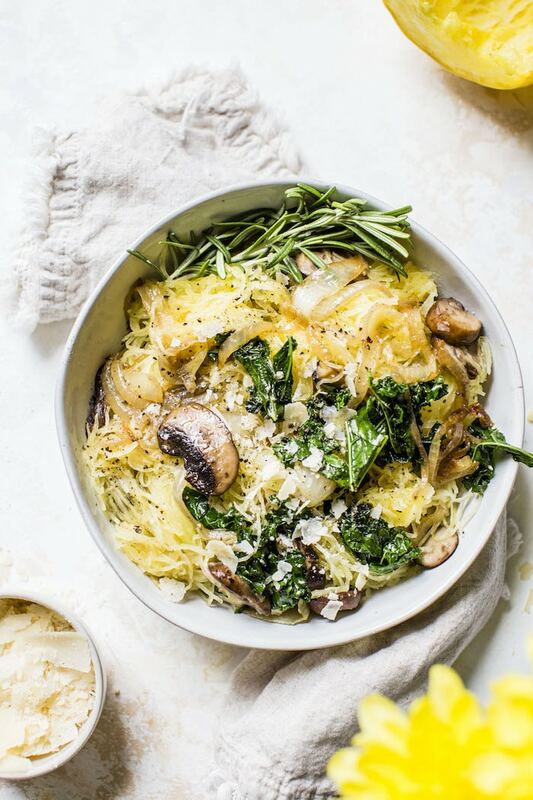 Onions sautéed with butter and olive oil create this scrumptious Caramelized Onion Spaghetti Squash recipe, complete with mushrooms! Slice squash in half, remove seeds and place on baking sheet. Brush 2 tbsp olive oil on both sides of the squash (1 tbsp per half) and then place face down in the oven. While squash is roasting, melt butter and last 2 tbsp oil over medium-high in a large skillet. Add onions to skillet, stirring occasionally. After 5 minutes, add mushrooms. After approximately 10 minutes, the onions should start to caramelize. If they look like they’re burning at all, add an extra tablespoon of oil. 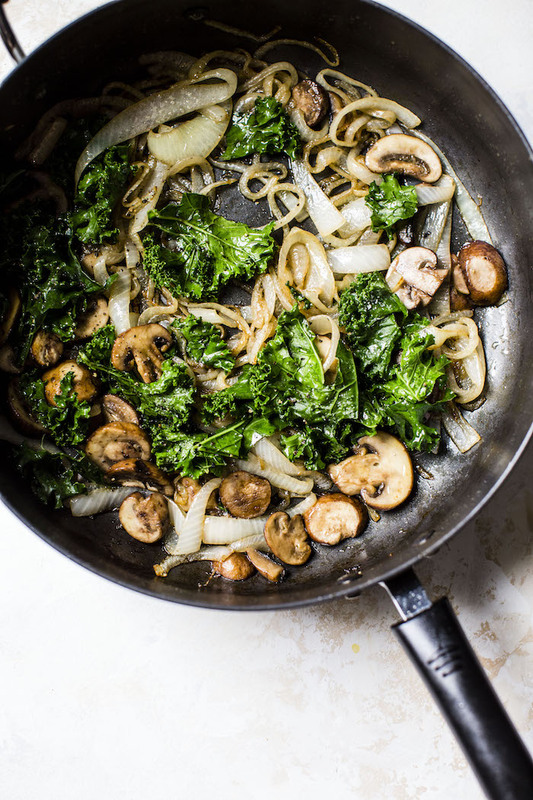 Add kale to skillet and continue to stir everything together until onions turn a nice golden brown color. After 45 minutes, remove squash from oven and allow 10 or so minutes for it to cool off. 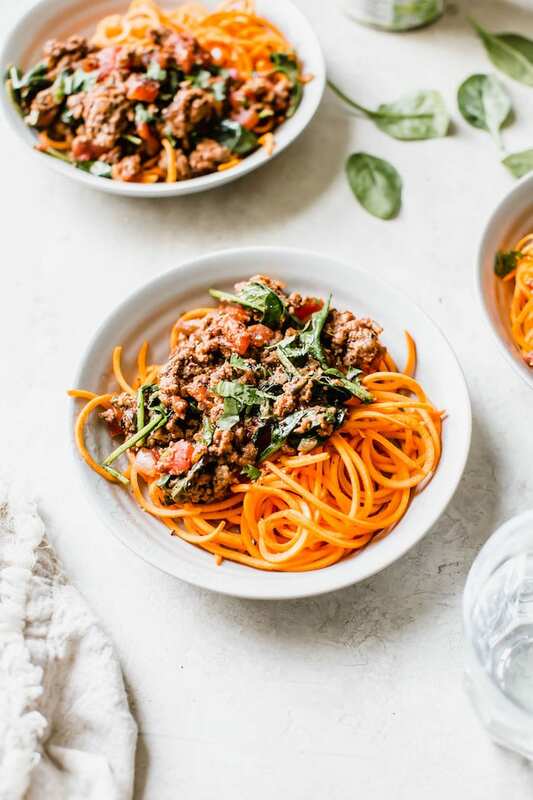 Once slightly cooler, use a fork to remove “spaghetti” from squash and place in a skillet; add rosemary, salt and pepper and stir everything together. Add parmesan cheese if you wish and enjoy! Q: Have you roasted spaghetti squash? What’s your favorite way to eat it? <<I have another squash waiting to be roasted, so I want to know! I added spinach and kale and very thinly sliced carrots and zucchini. It’s my 3rd time and I just wanted more veggies! I also sautéed a chicken breast earlier and tossed in at the end. We love this s much! Try adding zuchinni… or eggplant…or I used sugar snap peas. Very good recipe. I used about 1 tsp of salt. I would use only half of the spaghetti squash (the ones we get are pretty large). Hi Erin! I am allergic to mushrooms – what alternatives would you suggest? Thanks!! I’m looking to try this recipe tonight and I don’t have mushrooms so I’m going to use some roasted eggplant I made the night before…it’ll carmalize nicely with the onions. 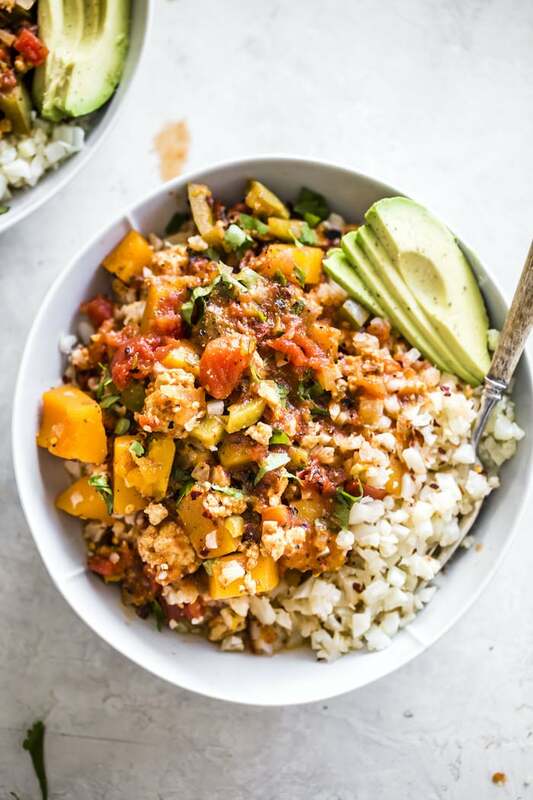 Try adding zuchinni… or eggplant…or I used sugar snap peas.try adding some sundries tomatoes and little crushed red peppers… gives it a great warm kick on cold nights!! This was amazing!! Was looking for something to go as a side dish with Quinoa and this recipe worked perfectly!! Even without the Parmesan cheese and thyme instead of the rosemary, it still tasted fabulous! Will definitely be making this again with the rosemary too. I’m so glad you and your family enjoyed this recipe! Really good recipe. We don’t like kale so I used spinach. My husband usually turns his nose up at vegetarian but this time we both had seconds and look forward to leftovers for lunch tomorrow! Woohoo–I’m glad you BOTH enjoyed it! I absolutely adore mushrooms, onions, and spaghetti squash so I expect to love this recipe, especially based on other comments. I can’t wait to try it. Perhaps today! Just last week I stumbled across a Pinterest post on how to properly cut and cook spaghetti squash. It was very informative. Turns out I was doing it wrong, I had been cutting it lengthwise, cutting the strands in half. The strands run around the circumference of the squash so i should cut across the squash, not lengthwise. There were more re tips about the best cooking methods, too. See How to Cook Spaghetti Squash @eatwithinyourmeans or search Pinterest for the same title by Eatwithinyourmeans. This is one of my favorite recipes ever! I love it. It tastes so good! I don’t count calories and therefore don’t provide nutrition info. However, you can input the ingredients into an app like MyFitnessPal, etc. Just made this and it is SO good! This was my first time making spaghetti squash – I’m trying to start cooking more as well as cooking healthier. I’m so glad you liked it Alina! are the mushrooms sliced or whole? do you really mean to oil the skin of the squash or just the cut part? is the kale chopped? small pieces or large or ? Hi Anne–to answer your questions: sliced mushrooms preferably, you’ll want to oil the cut edges and the outside of the squash, and it doesn’t matter the size of the kale because it’ll shrink up as soon as you cook it in the butter/oil. Let me know how you like it! I sliced the mushrooms and rough chopped the kale. Left out the rosemary. Next time will add garlic I think. Thanks! How can I get the nutrition facts on this? This has been my go to comfort dish since discovering spaghetti squash 30+ years ago… I also add some sundried tomatoes and nitrate free bacon ..
On the rare chance there are leftovers.. warm it up and drop a fried or poached egg on top!! Yum!!! I replaced the butter with ghee as I don’t eat dairy. Thank you! Hi I just wanted to comment that Ghee is butter. It is just clarified butter with the fat taken out. It’s one of the most amazing things you could put in your body though…in Ayurvedic medicine it is considered a health elixer and has been revered in India for thousands of years. 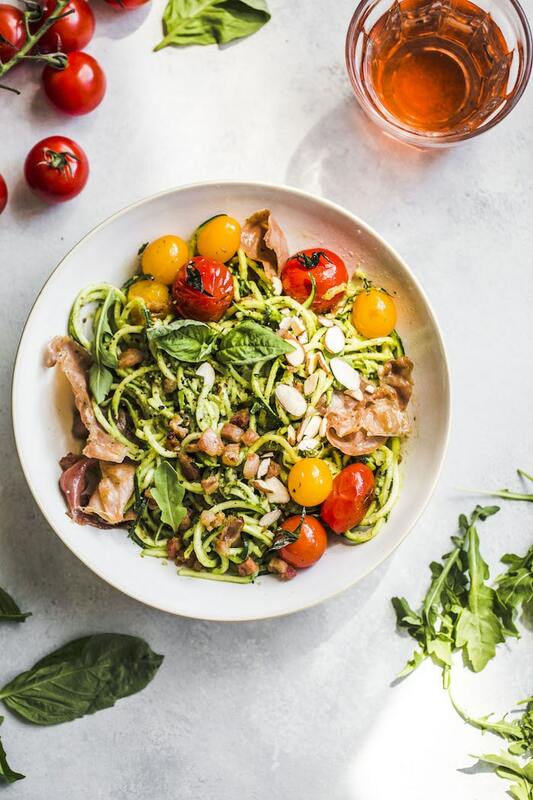 Another great substitute for cooking is Avocado oil (I don’t cook with Olive oil as it becomes damaging at higher heats). Anyway, just thought I would mention…hope this was helpful. 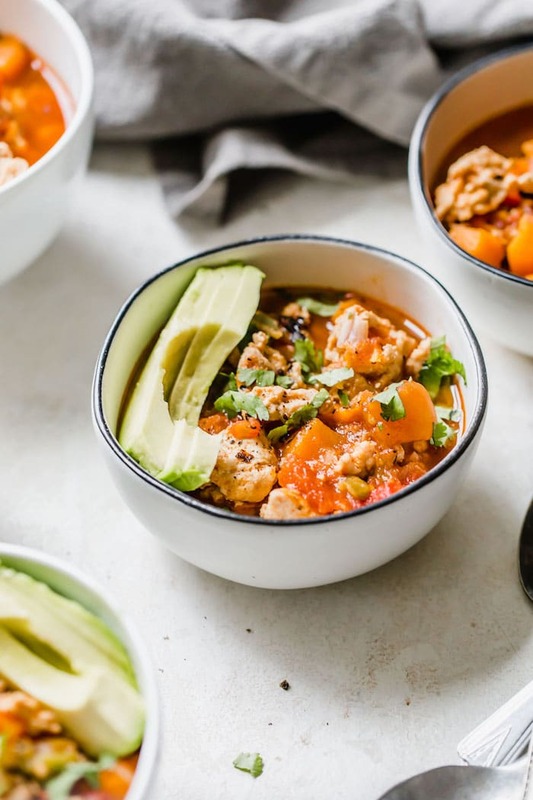 Do you have nutrition facts for this recipe? How much protein does it have per serving? Wonderful! I added some cubed tempeh to the mix. I am preparing this as I type for dinner this evening. Everything smells so delicious! I am finding, however, that my spaghetti squash is taking a lot longer to roast than 25 min. Though I have no doubt that this meal will be fantastic everything else is done and I sit here waiting on the squash. 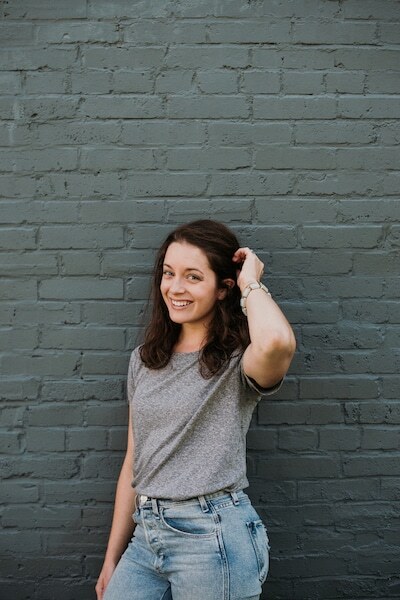 Love love love the new site design Erin! It looks amazing. And goodness gracious this recipe. I have allllll the emoji heart eyes right now. Pinned! I loveee spaghetti squash. Lately my favorite way of making spaghetti squash is as a lasagna-style boat – baking it with marinara, cheese and herbs. Sooo good. But I need to give this a try too! Caramelized onions are the ONLY way to eat onions in my opinion! The caramelization brings out the perfect comforting, buttery sweetness that i absolutely adore! That being said, I need to get my booty in the kitchen and try this recipe out. Ah! It made my heart happy when you said “Giant Eagle” 🙂 I forget when fellow bloggers are near and shop at the same stores I do! Although technically speaking I think mine are just “Giant”, but whatevs. Isn’t spaghetti squash THE BEST?! I literally feel like I could eat it with anything. This dish looks like the perfect way for me to change up my consumption. Gosh I really just want to live in grocery store sometimes. Can that be possible? << Sorry that was semi-random and completely unfiltered thought to keyboard happening. Oh this looks so good! I love caramelized onions and mushrooms so this is my kind of meal. The pics are gorg and I LOVE your silver plate too. Where is it from?! Also, I completely agree with you on the foreign ingredient thing. Nutritional yeast might be foreign to someone who follows a SAD (that’s standard american diet…which is truly SAD, ha!) but to vegetarians and vegans, it’s pretty common. It’s hard to please everyone, le sigh! 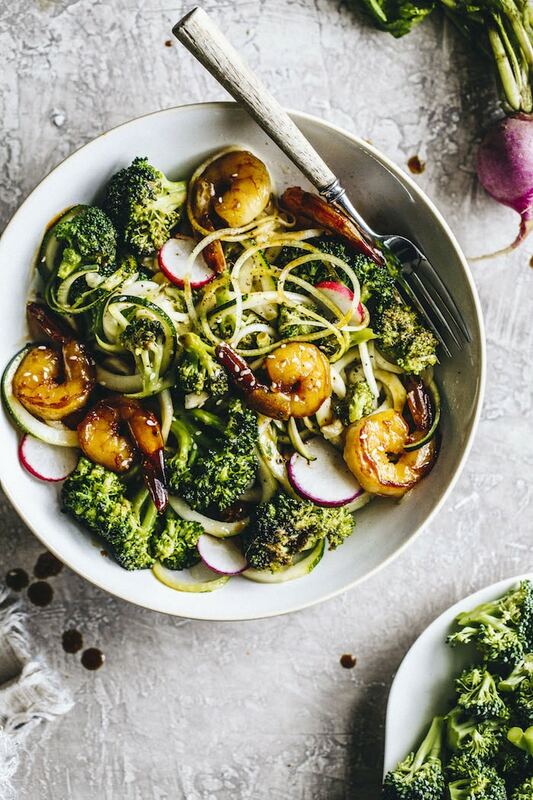 Erin, you’ve got a good thing going here – from the shrooms to the kale to the rosemary to the caramelized onion and squash – I adore each of these ingredients uniting like this! I love, love, love spaghetti squash! Last week, we made a unique recipe using spaghetti squash. It was a “Spaghetti” Pie on the blog Simple Roots. Yummy and definitely a must make! Love spaghetti squash! Caramelized onions are just the flavor bomb too! yep, food twin. You are mine and i need this in my life. Save me a plate, k? I wish I had this recipe last week when I had two spaghetti squashes I needed to roast! This looks so delicious. 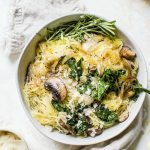 I have been all about spaghetti squash lately and the addition of caramelized onion just won me over! LOVE and WANT and NEED! 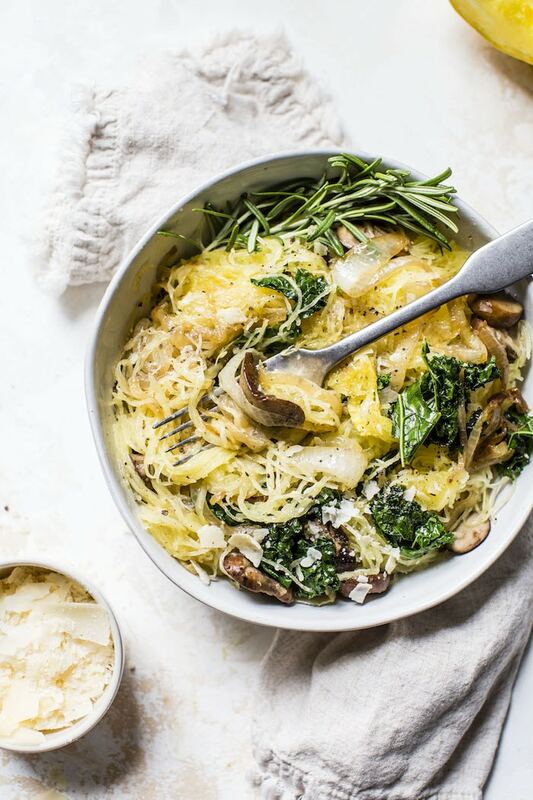 Because its proven that spaghetti squash is 1000000 times better with caramelized onions!